None. Scarlet sage cannot tolerate cold temperatures. Mix a light application of a balanced organic fertilizer into the soil prior to planting. Catnip and Lavender. Mixes well with upright flowers or herbs, and the blossoms are much loved by hummingbirds. Scarlet sage needs warm soil to grow well, so wait until the last frost has passed to set out plants. Start seeds indoors in individual containers or set out purchased plants. Space plants 12 inches (30 cm) apart in all directions. Pinching off the first bloom will encourage plants to grow into lush bushes bearing numerous flower spikes. Gather stems to use in cut arrangements. Snip off old flowers every few weeks to keep plants in bloom all summer. 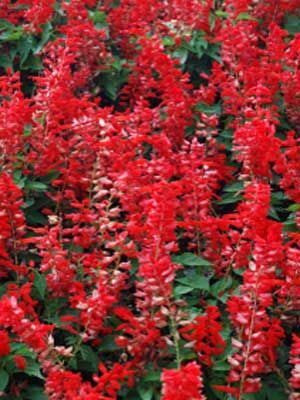 Scarlet sage has few problems with pests or diseases. Newer named varieties are vigorous and very heavy blooming.